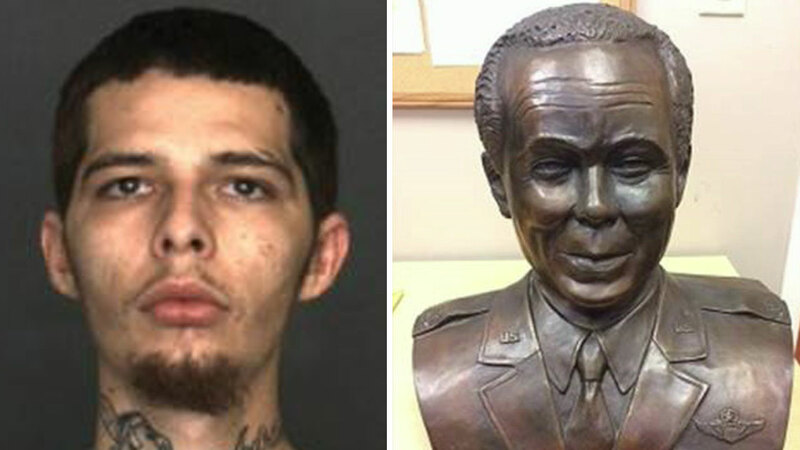 RANCHO CUCAMONGA, Calif. (KABC) -- A traffic stop in Rancho Cucamonga led to the discovery of a stolen Tuskegee Airman statue that had been missing for more than 14 years. The stop was conducted around 8:40 p.m. April 7. During the stop, a San Bernardino County sheriff's deputy learned the driver, 24-year-old Brian Sawyer, was on felony probation and did not have a license. The deputy then searched Sawyer's car and found meth, heroin, a loaded gun and ammunition. Sawyer then confirmed his address in Fontana and another search was conducted. During that search, authorities found another gun, drug paraphernalia and more ammunition. The deputy who conducted the stop also found a statue of an Air Force colonel in Sawyer's bedroom. It was a bust of Col. Ralph Smith with the words "Tuskegee Airman" engraved on it. The deputy then discovered that Smith lived in Moreno Valley, so he contacted the man and learned the bust was created by sculptor Don Winston, who had given Smith the statue in 2003. Winston had been contacted by the Smithsonian Museum to put the bust on display, but around that time it had gone missing. Smith told the deputy he thought he would never see it again. The deputy and his team then headed to Smith's home and brought back the statue. Sawyer was arrested and booked into West Valley Detention Center on suspicion of possession of a controlled substance while armed, felon in possession of a firearm and possession of stolen property. His bail was set at $50,000 and he posted it on April 9. Anyone with more information on the incident, or other crimes possibly committed by Sawyer, is urged to contact the Rancho Cucamonga Police Department at (909) 477-2800. Those wishing to remain anonymous may call the We-Tip Hotline at (800) 782-7463.